The Brouwerij Westmalle is associated with the Abbey of Our Lady of La Trappe of the Sacred Heart near Westmalle in Belgium. Monks first arrived at the site in 1793 and the monastery was officially established in 1794. It's interesting to note that it was three French monks who stopped in Belgium on their way to America, who were convinced by the local prelate to stay and establish the community. The monks were forced to abandon the site a number of times due to war, but have been on the site continuously since 1814. A brewery was set up in 1836, and the first beers sold to the public in 1861, though beer was only sold at the Abbey gate until 1921. With the exception of a brief lapse during WWI production has been continuous. The brewers of Westmalle are said to have coined the Dubbel and Tripel names. The monks brew three different beers. The Westmalle Dubbel and Westmalle Tripel are sold to the public. 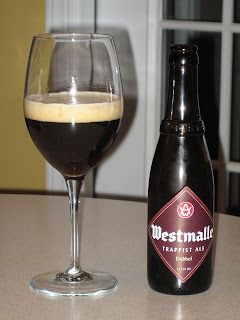 As with some other Trappist breweries, the monks reserve a third, Westamlle Extra, for themselves and their guests. For this entry we decided to enjoy some Westmalle Dubbel. The embossed bottle bore a label date stamp of 18/12/08. The beer pours a dark brown color, reminiscent of root beer, with a frothy light brown head. The head soon drops leaving behind a thin ring. The aroma is very subtle and we struggled to come up with specifics. It's mostly lightly sweet malt, with some faint dark fruit and a mild spice note. The taste is as easy on the palate as the aroma was on the nose. Malt and caramelized brown sugar come to mind. There's a hint of cinnamon noted. The finish is dry and mildly bitter, with a lot of carbonation felt on the tongue. As we enjoyed the Westmalle late on Good Friday, we were unable enjoy any food with the beer as it was a day of fasting, but some soft cheese and/or chocolate would have made an enjoyable pairing. This is the last post in our Lenten exploration of Trappist beers. We managed to look at five of the seven Trappist breweries producing these exceptional ales. Each of the beers we tried was unique and enjoyable. Looking at the history of the breweries was very interesting to me. That these simple and holy men could create such fine beers, and continue making them for many years, often enduring trials and hardship, is a testimony to their dedication. Producing beer is a sideline for these monks. The profits are used to support the abbey and the charitable works of the monks. Dedication to quality not quantity is at the forefront and production is controlled by the monks themselves. It's no wonder beer aficionados the world over seek out these tasty beers. The first post in the series is here.